Ooooh… lace. 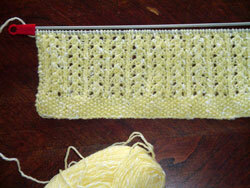 I’ve been knitting lace lately myself. Is it that Spring is in the air? That’s so pretty and delicate! So sorry I missed you on the weekend. I didn’t know you were coming and of course that’s the weekend I pick to go away. I think we’re jinxed! The last time you came our car broke.